Time is so precious, but so is your health! Here are 6 quick dinners that are so delicious; you’d never know they were good for you too! 1. SEASON chicken lightly with salt. Heat 2 teaspoons of the oil in large nonstick frying pan or cast-iron skillet over medium-high heat. Add chicken and cook until lightly browned and cooked through, about 5 minutes. Transfer to plate. 2. RETURN pan to heat and add remaining 2 teaspoons oil. Stir in bacon and cook until starting to brown, about 2 minutes. Add Brussels sprouts, sweet potato, and onion. Cook, stirring occasionally, until crisp-tender, about 5 minutes. Stir in apples, garlic, thyme, and cinnamon. Cook 3 minutes. Pour in 1/2 cup of the broth, bring to a boil, and cook until evaporated, about 2 minutes. Add reserved chicken and remaining 1/2 cup broth. Season with the salt and black pepper as needed. Cook until hot, about 2 minutes. 2. PREPARE steak while rice cooks. 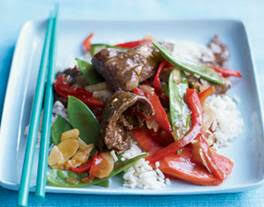 Toss steak with 2 teaspoons of the soy sauce. Heat 1 teaspoon of the oil in nonstick frying pan or cast-iron skillet over medium-high heat. Add ginger and garlic. Cook, stirring, 30 seconds. Add steak and cook, stirring occasionally, 2 to 3 minutes. Transfer to a plate. 3. RETURN pan to heat, and add remaining 1-teaspoon oil, carrots, onion, and pepper. Cook, stirring occasionally, until it starts to soften, about 3 minutes. Stir in snow peas and almonds. Cook, stirring occasionally, 2 minutes. 4. ADD reserved beef and juices, hoisin sauce, and remaining 1 teaspoon soy sauce. Cook, stirring, 1 minute. Serve over rice. Heart-Healthy Tip: Antioxidant-rich carrots, onions, bell peppers, and garlic keep your arteries healthy. 1. COMBINE water, allspice, 1/2 cup of the orange juice, and 1/4 teaspoon of the salt in saucepan over medium-high heat. Bring to a boil, stir in couscous, cover, remove from heat, and let stand 5 minutes. Fluff with fork. 2. HEAT oil in large nonstick frying pan over medium-high heat while couscous cooks. Add onion, pepper, garlic, and curry powder. Cook, stirring occasionally, until vegetables are tender, about 10 minutes. Add chickpeas, apricots, and cranberries. Cook, stirring occasionally, 2 minutes. 3. POUR in remaining 1/2 cup orange juice and cook, stirring often, 1 minute. Remove from heat and stir in cilantro and remaining 1/4 teaspoon salt. Serve over couscous. 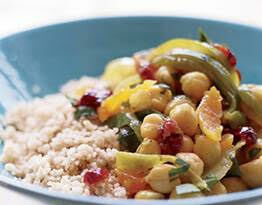 Heart-Healthy Tip: Perk up low-salt beans with the sweetness of orange, apricot, and cranberry. 1. PREPARE salad: Heat oven to 450°F. Toss cauliflower, carrots, and salt with 1 tablespoon of the oil on rimmed baking sheet coated with cooking spray. 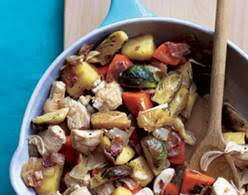 Roast vegetables until tender, 18 to 20 minutes. 2. WHISK together vinegar, sugar, oregano, thyme, pepper, and remaining 1 tablespoon oil in medium bowl. Toss in vegetables. Cool to room temperature. 3. 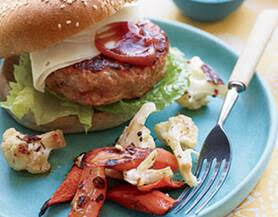 MAKE burgers: Combine turkey, onion, tomato paste, garlic, oregano, and basil while vegetables roast. Form into 4 patties. 4. HEAT oil in nonstick frying pan or cast-iron skillet over medium-high heat. Add patties and cook 10 minutes, turning once. Top each patty with 1 slice cheese, cover pan, and cook until cheese melts, about 1 minute longer. 5. ASSEMBLE burgers on buns with 1½ teaspoons ketchup and a lettuce leaf. Serve with the salad. 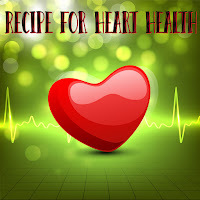 Heart-Healthy Tip: Nearly 3 tablespoons of heart-healthy monounsaturated olive oil pair with veggies and lean protein. 1. HEAT 4-quart Dutch oven coated with cooking spray over medium-high heat. Add beef and cook, breaking into smaller pieces with wooden spoon, until no longer pink, about 3 minutes. Stir in garlic and 1 cup of the onion. Cook, stirring occasionally, until onion starts to soften and beef browns, about 3 minutes. Add chili powder, oregano, and cumin. Cook until fragrant, about 30 seconds. Add tomatoes (with juice) and beans. Bring to a boil, reduce heat to medium, and simmer, partially covered, 15 minutes. Remove from heat and stir in chocolate and salt. 2. PREPARE pasta per package directions while chili is simmering. 3. SERVE drained pasta topped with chili. Sprinkle each serving with cheese and remaining onion. Dollop each with 1 tablespoon of the yogurt. 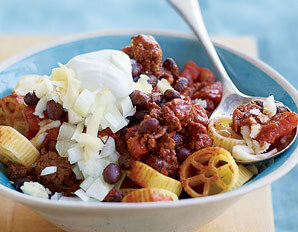 Heart-Healthy Tip: Pump up blood pressure-lowering fiber with no-salt-added beans and tomatoes. 1. BOIL first three ingredients for chops in small saucepan over medium-high heat until syrupy, 10 to 15 minutes. 2. PREPARE barley while cider mixture cooks: Bring water and 1/8 teaspoon salt to boil in saucepan. Add barley, cover, and cook over medium-low until liquid is absorbed, 12 minutes. Let stand 5 minutes. 3. COOK onion and mushrooms in oil in frying pan over medium-high heat while barley cooks. Sauté until browned, 8 minutes. Add garlic, tomatoes, pepper, and 1/8 teaspoon salt. Cook 3 minutes. Add barley. Cook 1 minute. Turn off heat, stir in parsley. Cover. 4. SPRINKLE pork with salt and pepper. Put on baking sheet coated with cooking spray. Brush with glaze. Broil 2 minutes. Turn, brush with glaze, and broil 2 minutes longer. Remove and brush with any remaining glaze. 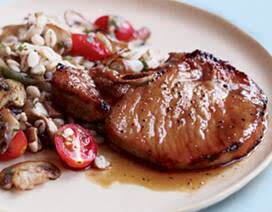 Serve chops with barley. Heart-Healthy Tip: Whole grain Barley teams with loin pork chops--the leanest kind.